Don’t let the amount of pages in Managing for Success: Practical Advice for Managers by Steven Smith give you the idea that it is “light” on practical ideas. On the contrary, the author seems to understand an important concept that is facing all managers – especially new ones. That concept is this: “You will have more work to do than time, so let’s just cut the fluff and get to the good stuff!” Smith doesn’t keep the reader waiting to get to concepts and advice that can save a first time manager’s career and sanity. How much money is that worth? I guarantee you, it is worth at least as much as this “mentor on a shelf” is priced at – probably much more. Managing for Success distills the topics of hiring, staff motivation, enriching jobs, setting goals, delegation, coaching, decision making, conducting performance reviews, holding staff meetings, building trust, and others in a way that makes it feel like you have a friend with their arm around your shoulder trying to give you the advice that they had to learn the hard way. You can try and learn these principles yourself, and if you are lucky enough to survive in your new position long enough, you might pick up half of them. There is even a section on “Managing Your Boss”, which over the years I have found to be a skill that is mandatory for survival and sanity. Having taught Business courses in high school for 7 years, this is the kind of book that I wish I had to point students to. I could have chucked half of the textbooks I used and just followed the topics and expanded upon them enough to insure that they grasped the concepts and practice them in different scenarios. This advice may sound harsh, but I have lived this. Spending most of your time trying to get someone “up to speed” who probably shouldn’t be there in the first place could well be the worst way for a new manager to spend their time. You don’t want to be too quick to let someone go (after all – they are a real person with feelings and families), but dragging out a poor performers “career” in a job that they are ill suited for isn’t exactly looking out for their best interests either. So why does this book come with my highest recommendation? It is better to have a game plan and hope you don’t run into the situation rather than run into the situation and have no game plan. Invest in yourself, invest a little in this book – or you may not have to worry about being a manager long enough to worry about all of the things you wish you would have known going into the position! 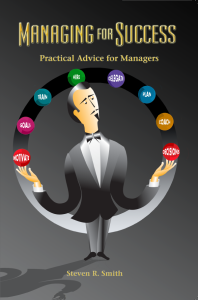 “Managing for Success: Practical Advice for Managers” by Steven Smith is an easy to read guide with very much needed advice. After being in the corporate world for many years as a manager and a managed resource, I can relate to all the points presented in this book. Smith begins by making a very true affirmation about how most employees are promoted to managers because they excel on very specific technical skills, and because of this are expected to take on all managerial functions with very little or no training at all. In fact, and I can be witness to this, they are quickly trained or oriented by people who had been promoted into their positions in the same way. This lack of importance given to the managing functions training is what creates most of the productivity problems caused by lack of team motivation, a high turnover rate, performance, and general poor resource management within the department. Smith exposes in his book the premise that simply investing in the training of managers and supervisors on specific skill sets such as planning, motivating and coaching, delegating, hiring, evaluating, department culture building and work environment enhancing, will provide a department or even an entire company with successful managers, which in turn will have a positive effect on productivity as goals are more likely to be reached. I found “Managing for Success” refreshing, easy to read and very helpful for my own company’s managing needs. This is due not only to the quality of the content but also to the way Smith presents his advice. Each chapter is well written, simple and right to the point, providing the reader with practical and realistic problems and solutions that can be applied immediately. At the end of chapter, Smith summarizes with take away bullet points for the reader to refer to quickly when needed. “Managing for Success: Practical Advice for Managers” by Steven Smith is exactly what the title describes. I definitely rate this book as a must read for all professionals who aspire to be or are currently in a managerial position. I found much advice that I will be using in my own management style and know everyone that reads this will do the same! Calling upon his more than four decades of management and executive experience in the pharmaceutical industry, Steven R. Smith presents a clear, intelligent, highly useful manual for all modern managers. Smith covers every area of responsibility – with a focus on hiring – and begins from a compelling position: Most managers who are promoted due to their skills and achievements in various areas of business performance are ill-prepared for management jobs and could benefit from any guidance they can get. Smith’s pragmatic – if mainstream – advice provides very concise basic management training while offering worthwhile insights into employee-manager and manager-boss relations. getAbstract recommends Smith’s unpretentious, valuable primer to managers who could use a refresher and to those who are mostly winging it for now.